I have had many a panicked conversation with new beekeepers who have brought home a nuc of bees to a Top Bar hive and figured out that it’s just not gonna fit. Traditional nucs are comprised of 5 Langstroth frames, which aren’t compatible with Top Bar or Warre hives unless you do major frame surgery. It becomes a sticky, stressful situation for all involved and is a terrible way to kick off a beekeeping venture! I am speaking from experience because this is exactly how I got started. In the spirit of helping future beekeepers avoid this mix-up, let’s look at the differences between the two primary ways of obtaining honey bees: nucs and packages. Packages are small boxes filled with 3 lbs of bees (~10,000 bees)! There are large apiaries (bee yards) dedicated to raising bees and shipping them all over the country. These compact crates are full of worker bees and a mated queen kept in a protected cage. Packages do not include any kind of frame or comb. 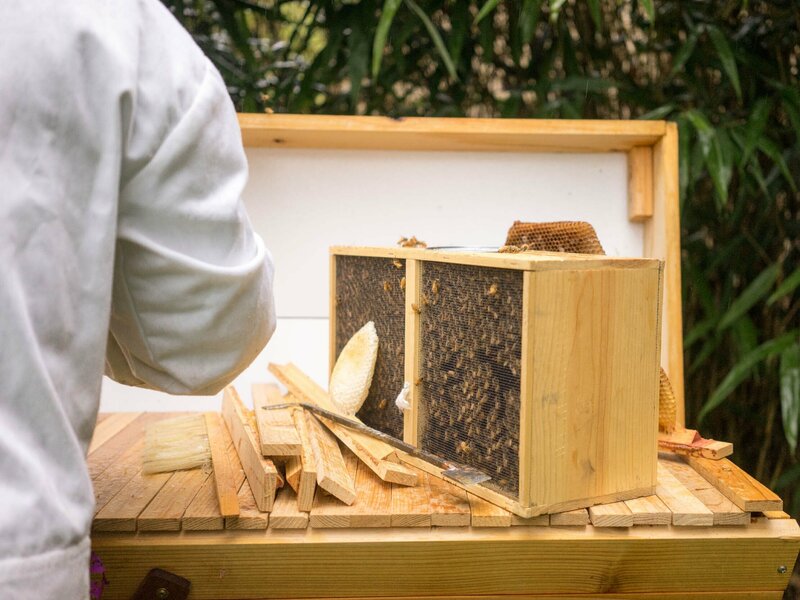 Once received, the packaged bees are shaken straight into an empty hive and the caged queen is placed inside with them. The bees will chew through a candy plug in the queen cage to release her, and then they will get started on their bee business. Since they can be shipped anywhere, they are available to people who don’t have nearby sources of honeybees. You get to observe the process of the bees starting from scratch, which is educational for a new beekeeper. 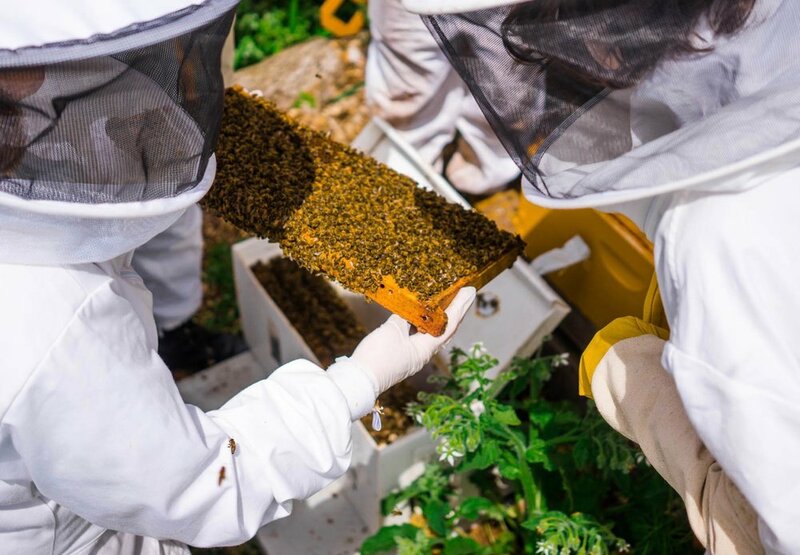 Packages are typically shaken together from several different “production” hives, and the queens are pulled from separate “queen rearing” hives. The quality of mass-produced honeybee queens have been called into question in recent years, and the fact that there are only a few large operations raising the majority of bred queens is dramatically reducing the gene pool. Because they are being shipped from across the country, the bees will not be acclimated to your location (weather, forage, pests, etc. ), which lowers their chances of survival. Being packaged and shipped is stressful for the bees and can weaken their immune systems. Since they are starting without any food or brood, they need to be fed for several weeks upon installation. Once again, because packaged bees do not start out with brood (baby bees), you will see the population dwindle in the first month. There are no new bees emerging to replenish the older population, and new bees won't start emerging until about 30 days after installation. 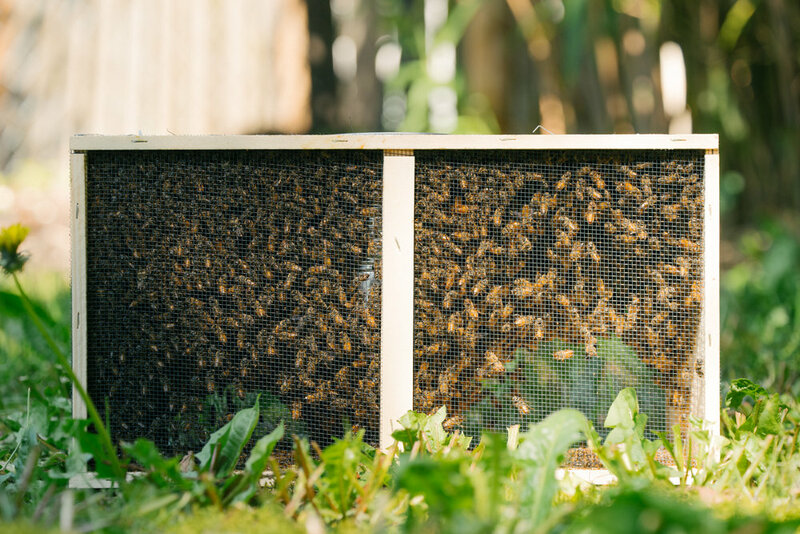 "Nuc" is the industry term for nucleus box, which is traditionally a mini Langstroth hive box with 4 - 5 frames of bees, brood, honey, pollen and a mated queen. Starting a new hive with nuc frames gives the bees a huge wing up over packaged bees and swarms because it is essentially a small but fully functioning hive already! They have drawn comb, brood, food and a laying queen. This means that the population will begin growing upon installation, as opposed to the population dwindle that occurs with packages. Nucs are not easily shipped, so you will typically be picking them up from a location closer to where you live. Bees moving from Washington to Oregon will be better off than bees moving from Florida to Oregon! This also allows you the opportunity to learn more about the people who raised your bees. Rather than throwing together random bees from different hives, a nuc is working colony of bees with their proper queen in place. This allows you to verify the quality of the queen and eliminates the concern that your bees will reject her. Nucs are typically less susceptible to starving, absconding or robbing than packaged bees. They are best for cold climates with a short growing season because the bees need less time to build up their population and put away adequate food stores for the winter. Nucs are not produced in the quantities that packages are, so they are not as readily available in the spring. Traditional nucs will only work with deep frame Langstroth hives, but some suppliers are starting to offer them in medium boxes as well. However, as top bar beekeeping gains traction in the US, we are starting to see more Top Bar and Warre nucs become available. It is on a very small scale at the moment, but check in with your local beekeeping association to see if anyone in your area is providing these kinds of nucs! Whether you decide to go with a nuc or a package, do your research on the apiaries you purchase from. Don’t make your decision based on the cheapest rates or quickest delivery - look into the quality of the queens, experiences from past customers, use of chemical treatments, etc. If you are planning to run treatment free hives but purchase bees that have been heavily treated, don’t expect your colony to thrive. Okay! Consider yourself educated on the difference between packages and nucs. Every situation is different, and there is no bad option. Eventually, the goal is to have healthy hives that overwinter successfully, from which you can make splits (or catch swarms) and expand your apiary! You certainly don’t want to purchase bees forever, but it is a great way to get started.